Every bank needs quality job descriptions. Using job descriptions will help your bank better understand the experience and skill base needed to enhance the success of the bank. They help in the hiring, evaluation and potentially terminating employees. All too often there is a misunderstanding of what a position entails and a well-prepared job description can help both sides share a common understanding. Why use our job descriptions? Click the image to see a sample. BankHR knows that finding detailed bank job descriptions is a difficult and time consuming process. In addition, finding bank job descriptions that have been tested under FLSA overtime exemption rules, and designated as such is non-existent, until now. We have made that resource easily available to you. We know the employment regulations, including the Fair Labor Standards Act and the American’s with Disabilities Act (ADA). All of our job descriptions have been tested and are designated as Exempt or Non-exempt under the recently revised regulations. This greatly reduces your time and effort in understanding this critical process. Also, all of our job descriptions are compliant with the Americans with Disabilities Act (ADA). We have assembled one of the largest collections of ready-made job descriptions you will find anywhere, and at a very low cost. Even if you have some job descriptions, our job descriptions will greatly assist you in maintaining compliance with safety and soundness standards, as well as identifying what jobs should be exempt and non-exempt. For a complete list of our job descriptions please CLICK HERE. 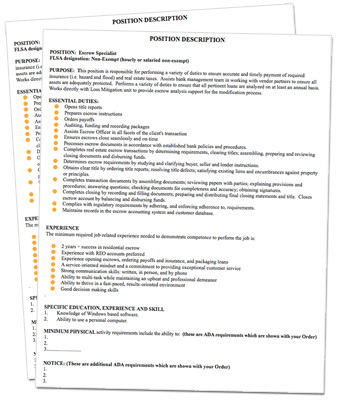 The job descriptions are in one MS Word file so they are easy to use and edit. This file is available in a .zip file or on CD. You will be invoiced on receipt of the file or CD. To order, send us an e-mail by clicking HERE and specify either .zip file or CD. Be sure to include your mailing address for CD orders. Total cost for all of the Job Descriptions is $199.00. That is less than $1.55 each!